Dominic’s menu consists of Italian inspired dishes as well as the chef’s favorite dishes from around the globe. The international menu will change weekly. According to La Jolla locals, Dominic’s is a paradise for seafood aficionados. Some of the most popular dishes include the “Baja Roll” consisting of Spicy Albacore and Yellowtail mix, avocado, cucumber, and gobo garnished with garlic mustard Ponzu, cilantro oil, Serrano Pepper, and cilantro. Another favorite is the Branzino Fish, a Mediterranean Sea Bass in a white wine sauce with capers, olives and cherry tomatoes served alongside golden mashed potatoes. As if that doesn’t sound enticing enough, Dominic’s has a Mediterranean-style raw bar, along with an array of authentic dishes from various regions around the world using the freshest local ingredients. Go check out the featured full bar and live jazz on Fridays! 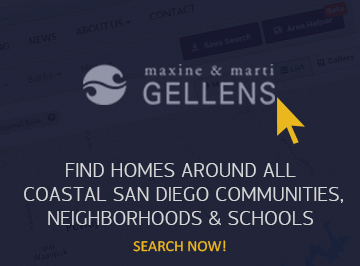 Maxine & Marti Gellens, Berkshire Hathaway HomeServices Maxine & Marti Gellens, Berkshire Hathaway HomeServices is in Del Mar, California.